Hotels in Velingrad, apartments, guest houses. SPA holidays in Velingrad, SPA hotels. Velingrad is one of the largest SPA centres in Bulgaria. It is located in the Western Rhodopes, near the Batak Dam. 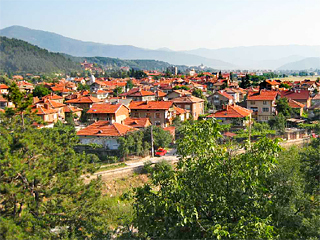 It is formed by the merging of the villages of Ladzhene, Kamenica and Chepino. The town is named after the partisan Vela Peeva who lived here. The beautiful scenery and abundance of mineral springs are the main reason for this area to have been inhabited since ancient times. There are mounds found on the territory of Velingrad, as well as cemeteries and walls of fortresses, suggesting that the Chepinski Region was inhabited by Thracian tribes in 6-5th century BC. There are remains of fortresses in its surroundings as the most famous one is Tsepina. The artifacts found in the area of Velingrad are exhibited in the Historical Museum in Velingrad, which is a part of the 100 National Historical Sites, which exhibits more than 17 000 artifacts. The museum owns more than 1000 painted eggs. There are also interesting temples in the town, such as St. George chapel, the oldest town church - Holy Trinity, St. George Church. The richest hydrothermal deposits of Bulgaria are located in Velingrad. The mineral springs are 80 in number, and together with the mild climate and beautiful scenery, they make the town one of the largest SPA resorts in Bulgaria which is officially recognized as the SPA capital of the Balkans. In the area there are many sanatoriums, mineral beaches, SPA centers and clinics. One of the symbols of the town is the spring with the eponymous park and the Kleptuza Lake, which are also a romantic and mysterious place. The spring is a karst one and a part of it forms two lakes and in the south of it there are evergreen pine woods, turned into a natural park that is visited by guests and residents of the town. The Velingrad surroundings are suitable for hiking, biking and sightseeing. The trails to Yundola, the Kladova Hut, Stariat Chark, Ledenika Cave, etc. are among the main tourist routes, starting from Velingrad. An interesting fact is that the intersection of the meridians of 24 and 42 is near Velingrad and there is an arranged route to the location. Those wishing to visit the town for medical treatment and rest may choose among the many first class SPA hotels in Velingrad, offering professional equipment and service combined with a wide variety of procedures. The town has a number of specialized facilities for medical treatment and rehabilitation. Of course, there are many separate apartments rented on hotel basis, which are preferred by those tourists who do not want to give up the comfort of their private home. The visitors may also stay at one of thewonderful guest houses in Velingrad. Wellness & SPA Hotel Zdravets is located in the very heart of Velingrad, close to several parks and a pine-tree forest. It is the logical choice for everyone who is looking for the perfect setting for a family holiday, SPA vacation, balneal healing or hosting various events. The complex features a great variety of accommodation, sports, relaxation and active entertainment options coupled with hospitable atmosphere, competent service and competitive rates. Maxi Park Hotel & Spa Velingrad is the perfect choice for an unforgettable spa holiday and a successful business event in the surrounding of the enchanting beauty of Mount Rhodope. The five-star spa hotel in Velingrad impresses with sophisticated and luxurious interior with elements from the classic and modern design. Besides a remarkable variety of services and first-class attendance, Maxi Park Hotel & Spa Velingrad offers unique location in the center of the city, yet surrounded by a quiet pine tree forest.